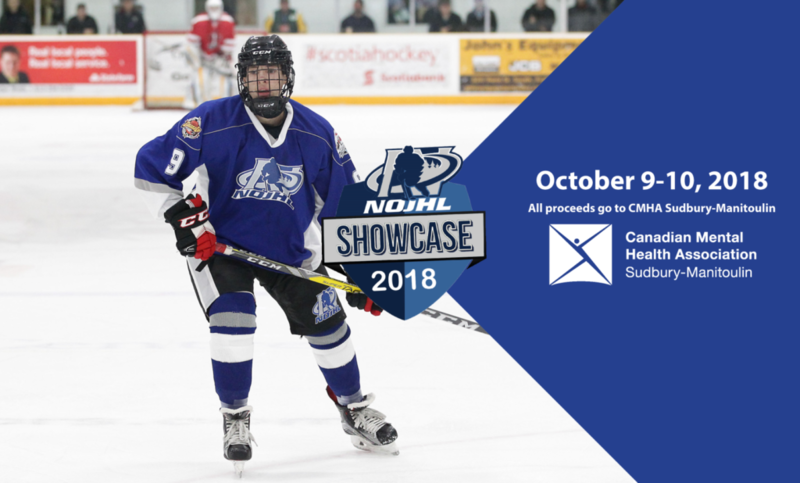 On October 9th and 10th, teams across the Northern Ontario Junior Hockey League (NOJHL) faced off in the 3rd Annual NOJHL Showcase in Sudbury. The action-packed, two-day showcase, which featured all 12 NOJHL teams, was also a chance for the league to show its community support with all proceeds from ticket sales going to the Canadian Mental Health Association – Sudbury/Manitoulin (CMHA-S/M) Branch. Everyone in attendance also had the opportunity to learn more about mental health services in their community from local CMHA staff. Last season the annual showcase raised over $5,000 to support mental health services offered through CMHA- S/M. A strong supporter of overall player development, the NOJHL is also entering its fourth season with CMHA’s Talk Today program, one of the most comprehensive mental health programs for amateur sports in Canada. Over the past three seasons in the NOJHL, over 550 players, 16 coaches/managers, seven billets/parents, and 22 office staff members have received safeTALK training. SafeTALK is an accredited training program that teaches individuals the importance of mental health and how to recognize persons with thoughts of suicide.